This section focuses on spreading awareness on the importance of heritage and its sustainability to ensure its continuation among the young and upcoming generation. From organizing forums, conferences, public events, workshops and poetry evenings to building ancient villages in the form of open museums. This section of the Events Department also participates in the festivals, celebrations and cultural events held locally and internationally to shed light on UAE’s cultural heritage, its civilization and human attributes. 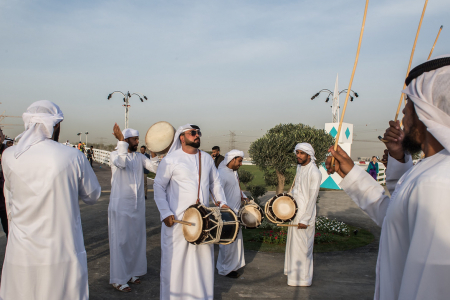 The Heritage Village is considered one of the prime destinations which the Festivals Section is tasked to construct, organize and manage annually, throughout its six-month duration at the Global Village in Dubai. The Heritage Village is built as an open museum to showcase the three environments of the UAE as they were in the past. It’s most important feature is the presence of craftsmen and women who showcase the old way of life at the Global Village starting at 4pm every day. Not only can visitors relive historic scenes but they can experience many celebrations, events and workshops that are held year-round within this open museum to learn more about Emirati social life and cultural fabric.